Preheat oven to 400 degrees F. Line baking sheet with heavy-duty foil. Place chicken (from Earls Meat Market) and pesto in medium bowl – toss to coat. Place chicken on prepared baking sheet. Bake for 20-25 minutes or until chicken is no longer pink in center. Remove from oven. Top with tomatoes and cheese. Bake for an additional 3-5 minutes or until cheese is melted. This low carb meal is the perfect addition to any menu! 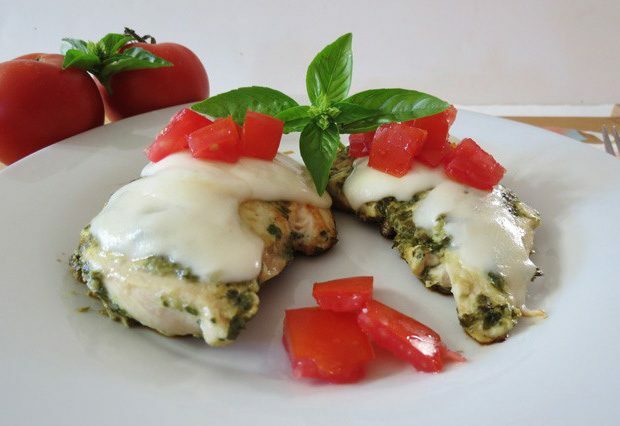 pair with a salad for delicious low carb supper!